Their breeding habitat is grasslands and prairie, also pastures and abandoned fields, across western and central North America to northern Mexico. Where their range overlaps with the eastern species, these birds prefer thinner, drier vegetation; the two birds generally do not interbreed but do defend territory against each other. The nest is on the ground, covered with a roof woven from grasses. There may be more than one nesting female in a male's territory. The nest is sometimes destroyed by mowing operations with eggs and young in them. 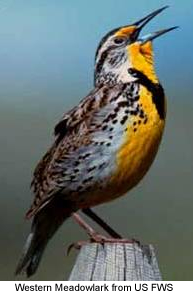 Western Meadowlark will interbreed with the Eastern Meadowlark where their ranges overlap, though their offspring are infertile. These birds forage on the ground or in low to semi-low vegetation, sometimes probing with its bill. They mainly eat insects as well as seeds and berries. In winter, they often feed in flocks. 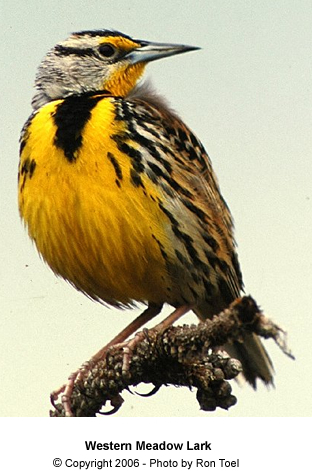 This is the official state bird of Kansas, Montana, Nebraska, North Dakota, Oregon and Wyoming.